Yesterday me and Andrew took a day out of the office to go to The Royal Welsh Show, the biggest agricultural show in Europe. Officially we were up there to see some of our existing and new clients, but we also took the opportunity to sit in some big tractors and pet some goats. 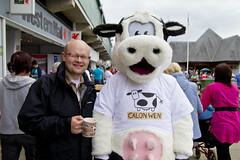 After being distracted by some big boy toys we managed to catch up with Calon Wen, who had a great stand, selling their newly packaged milk, cheeses and new milkshakes, they also served us a great coffee as Calon Wen milk makes great coffee! Also up in the show were Menter a Busnes with one of their projects, Energy Saving Trust with their Ynni'r Fro project, West Wales Eco Centre, for who we designed and developed the Climate Change Wales website. We also managed to catch up with some possible new clients as well, so all in all, a good day out.